After a long wait, cosmetics has been completely redone and is now available for all donator ranks! Like any large update, certain aspects may be disabled/enabled or added at any time. How do I get cosmetics? Currently, there are multiple chests at the Lobby relating to each donator rank. The golem at spawn will give you a number of different tiered keys relating to your rank. These keys can be used to open the chests. What makes the donator ranks different? The higher the rank, the higher tier key the user will receive resulting in a higher chance of getting a rare cosmetic. For example, those with God rank have a higher chance of getting a Legendary item than a VIP member. After many months, Prison will finally be opening for Testing this Friday(17/03/20). The following weekend (around the 24/03/20) we hope to have Prison open for all. - Prison will open Friday (17/03/20) at around 6PM GMT for Donators only. This will last the majority of the weekend. - The testing period will be used to gauge how quickly certain aspects of the game are achieved and will allow us to change this for the official opening. Therefore, many details such as the prices of ranks are likely to change. - At the end of the testing period EVERYTHING will be reset. So if you are not happy with a reset, DO NOT PLAY DURING THE TESTING PERIOD. LavaSurvival will be opening this Friday (10/03/17)! Scroll down to the bottom for more information. As some of you may have noticed, a new server called "lavasurvival" has appeared on the '/server' list. This server will be opening temporarily this Friday (10/03/17) at around 7PM GMT.Depending on how this goes it may be opened regularly during peak times, otherwise it will likely be changed for a similar idea in mind. Over the last month and a half our primary goal has been to develop and launch the new cosmetic system which will be in hopefully in testing later next week. A new post will be announced when it is released regarding this. Due to this, there were no major updates in January. ♛Cosmetics♛- The Update of Updates! As I'm sure all of the donators and many of the people who have visited the store may have noticed, since 1.11 cosmetics across PlanetMine have been non-functional. Hopefully this long awaited update about cosmetics will answer some questions! Skip down to the Tl;dr if you cant be bothered to read all the details. The current cosmetics system granted a donator rank a set number of cosmetics per rank. The higher the rank, the more perks they got. They would only get new perks if new perks were added to that rank (which was rare). This system is being completely scrapped for the new one. Just a reminder that the lobby now shows the correct top voters. Merry Christmas again to all those who celebrate it! Cosmetics may not be working on 1.11. This is a known issue and we will be looking at totally redoing the cosmetics in the new year with new features and more items to use. Before I start: There is a 50 % sale on over at The Store! This will last until December 31st! For those who don't know, votes are currently not being counted in the lobby. 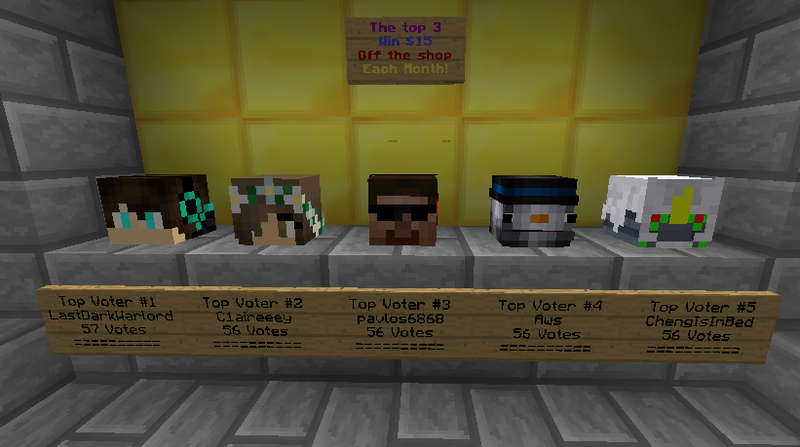 For that reason, Parkour is the current definitive counter of the top voters for each month. Dont worry, you dont have to be in Parkour to vote and can still vote while offline (When you vote it is sent to all servers). Thanks to everyone who votes! 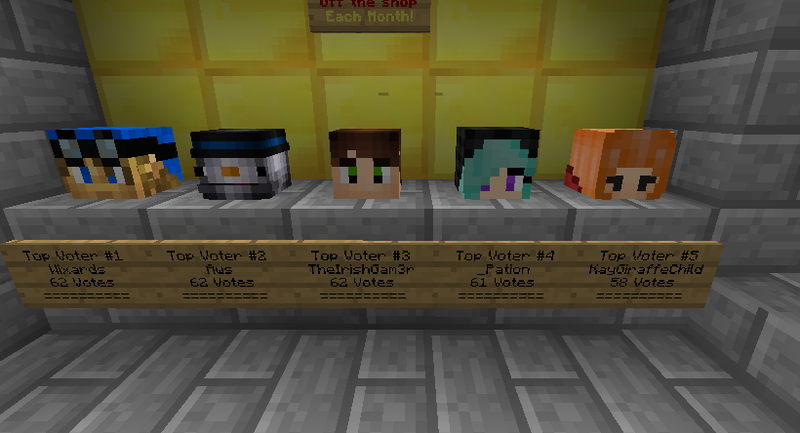 From January 1st, votes will be counted in Lobby correctly as usual.